Square cocktail table with four piece book matched birdseye maple top and walnut inlay; birdseye maple faced legs and edges. This is a moderate scale cocktail table in birdseye maple. 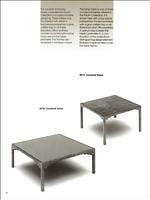 Derived directly from Pierre Paulin's 1984 Mitterand Elysee Office tables. A rare original prototype from the Pierre Paulin Collection introduced at the Baker Executive Office showroom at the 1988 Chicago NEOCON show. 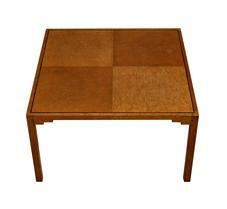 This is the actual table shown on Page 16 of the Baker Pierre Paulin Collection catalog. 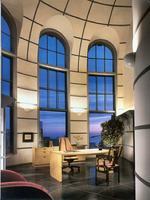 * Acquired by current owner directly from Baker Design Department, Grand Rapids, 1989. Very Good Original condition, with small area of finish loss to top; no damage to wood or color. 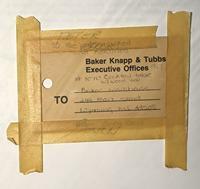 *please see the notation on the attached shipping label underneath the masking tape “to be photographed and returned;” please also note on the applied masking tape the current owner’s name and notation “Boston,” to direct additional shipping to the current owner, who was then General Manager of the Boston Baker Knapp & Tubbs showroom. lit. “Pierre Paulin Collection,” product catalog issued by Baker Furniture, 1988.